Being sent back in time to the Middle Ages wouldn't be so bad if the knight in shining armor who comes to your rescue didn't swoop down in the form of a fire-breathing dragon. Unfortunately for Jill Donahue, that's just the way things have been going in her life lately. A Maiden Wrenched back in time through the magical power of an old dragon tapestry found in a vintage clothing store, Jill Donahue lands in an ancient medieval town where the villagers decide to sacrifice her to the local dragon. As if the threat of being eaten alive by a giant flying lizard isn't bad enough, she learns there's a curse surrounding the tapestry and she has to break it in order to get back to her time. 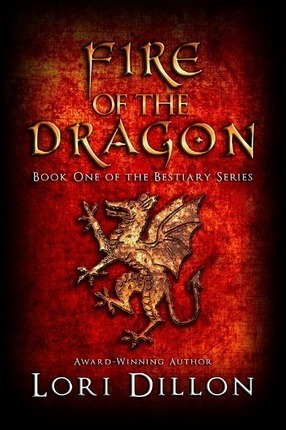 But she isn't the only one whose fate is tied to the ancient weaving... A Dragon Baelin of Gosforth is a valiant knight who has been cursed by a vindictive witch to live as a dragon for eleven months out of each year. Now he has thirty days to break the curse or he turns back into a fire-breathing beast and, as much as he hates to admit it, he needs Jill's help to do it. And A Curse Forced to face many challenges along the way-from the harsh world they travel through to the fiery passion they both try to deny-each is determined to break the curse so the other can get their happily-ever-after. And it just might work, if Jill can manage to overlook the fire-breathing, bat-winged remnants of Baelin's dragon half long enough to see the man beneath the beast and get the job done. In a previous life, Lori was a graphic designer for fourteen years. In her current existence, she lives in Virginia with her engineering geek/hero husband, two kids who test her sanity on a daily basis, a dog named Hokie (named after the Virginia Tech Hokies, of course), and various other critters of the furred and finned variety.